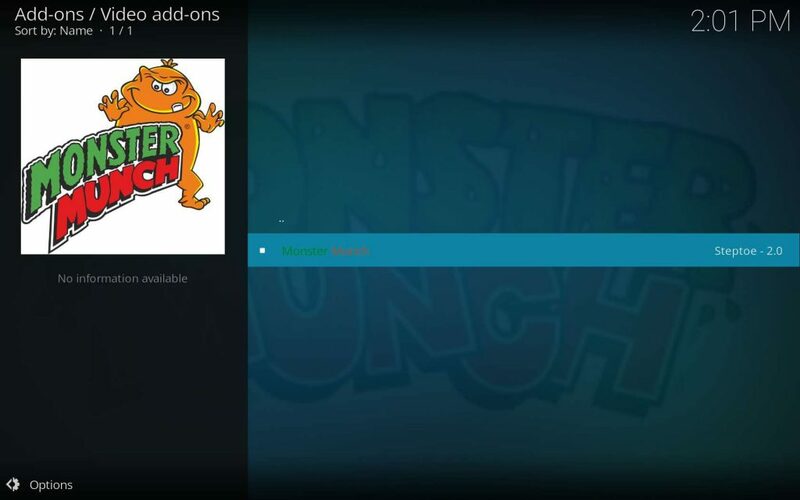 Monster Munch Kodi TV addon gives options you want, then plays videos the right way! You click on a title you wish to see, then wait for just a moment. Monster Munch automatically picks the best version available, then presents it to you. Presentation of huge lists of indistinguishable versions scrolling down your Firestick make no appearance in Monster Munch. 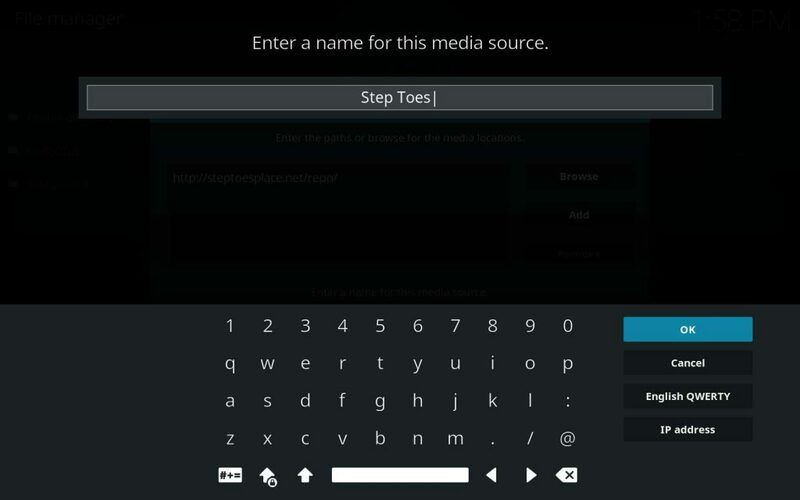 From the Step Toes Repo, this addon includes selections to fill every Kodi lover’s wish list. Categories such as New Movies, Horror, Movie Mix, Carry On, Vintage, Tube, TV shows, 24/7 Channels, World Cams, Fitness, Documentary, Boxing, UFC, Radio stations, Cartoons and many more make their homes here. 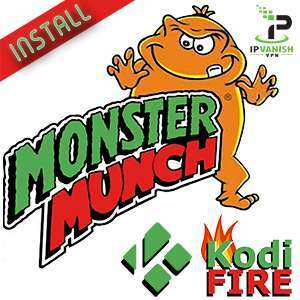 Before accessing content from third party Kodi TV addons such as Monster Munch, please set up and utilize a high quality VPN. This will ensure your privacy and anonymity, keeping your browsing and even your location (Ashburn, VA) away from prying eyes. Too many private groups fighting online piracy have sprung up recently to ignore the risks. Get yourself into a VPN tunnel, then remain invisible to even your own ISP. 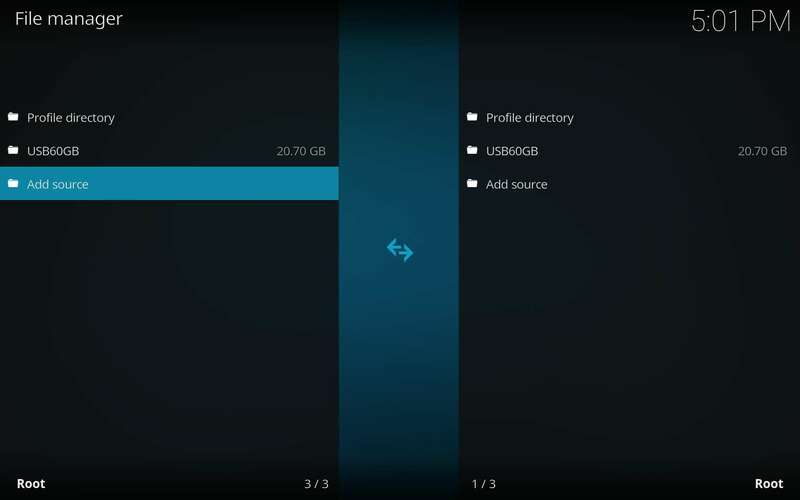 We have done a lot of comparisons, and IPVanish honestly seems to be the best VPN you can get for Kodi use. They also make the very best (free!) 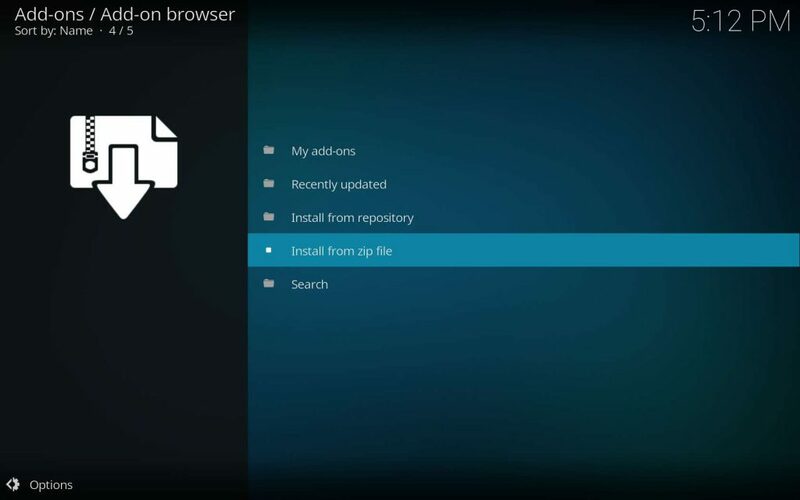 VPN apps specifically for the Firestick and Fire TV. IPVanish utilizes military grade encryption, IP masking, and several revolving methods that keep everyone in the dark about your identity and activities online. IPVanish also has the fastest speeds available anywhere with thousands of servers throughout the world. 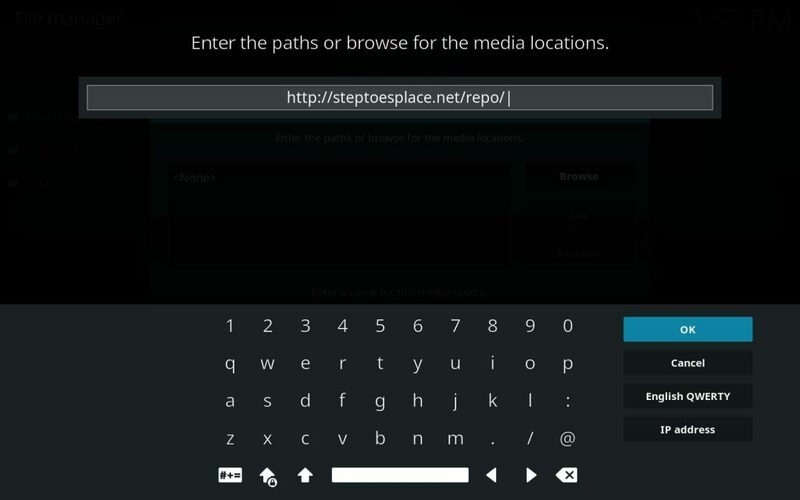 You get to pick the location from which you appear to access the internet with your Firestick, Fire TV, PC, Android, Mac, or any other device. The links we provide to IPVanish have a 60% discount coupon built in, which brings the price of the fastest, most secure VPN service for Kodi users to well under $5 per month! 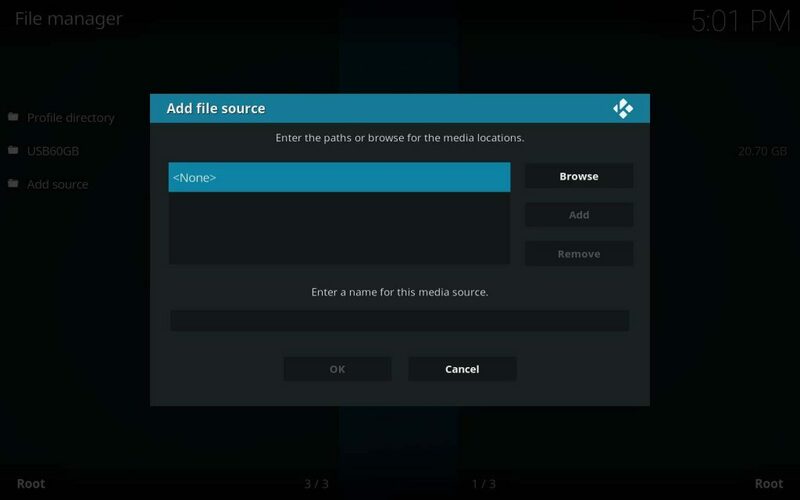 If you don’t know what “Unknown Sources” means within a Kodi context, then check out our super simple Enable Kodi Unknown Sources article. 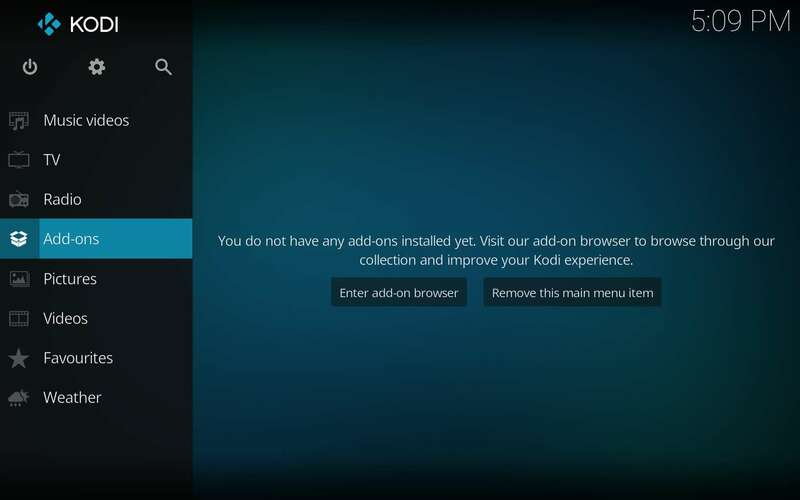 It won’t take but a second, and it’s required for third party TV addon installation since the release of Kodi 17 (codename: Krypton). We’ll keep the lights on for you! 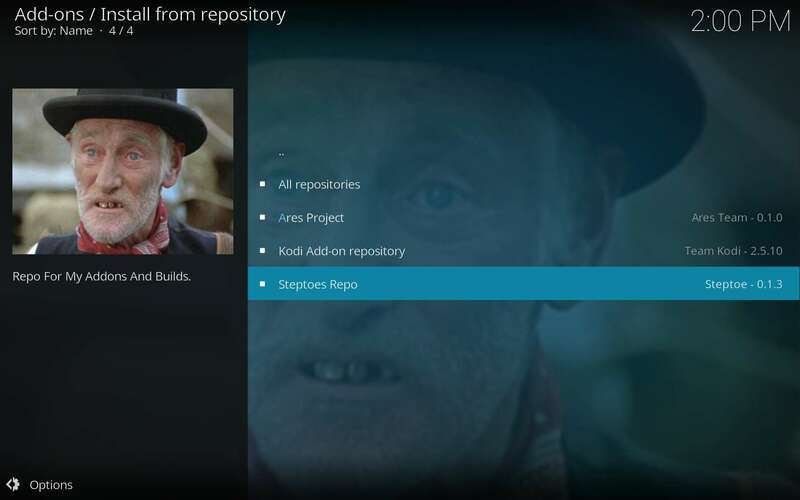 The Step Toes repository makes its home at http://steptoesplace.net/repo/. 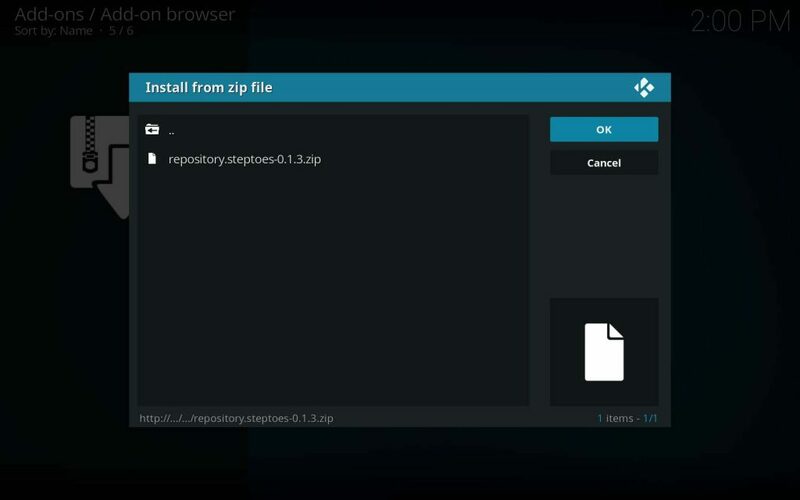 Now, we install the Step Toes repository from the source we just input. The Step Toes repository installed successfully! 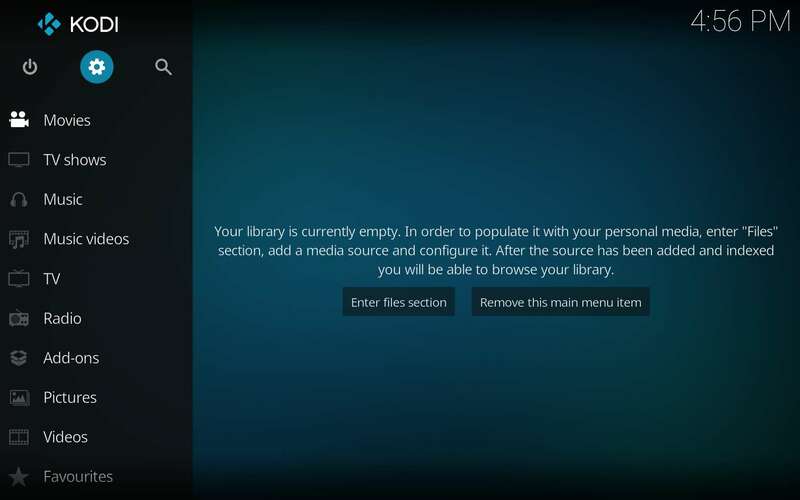 This repository is exclusive to Monster Munch and no other Kodi TV addons. Monster Munch makes its home within the Step Toes repo, ensuring we keep abreast of the latest updates. Once we’ve completed our installation of Steptoes, then we install Monster Munch. This Kodi TV addon caters to anybody tired of being presented with lists that mean nothing to them. Watch what you want to watch without hunting and pecking on random selections, then hoping for the best. Get the best handed to you right off the bat! 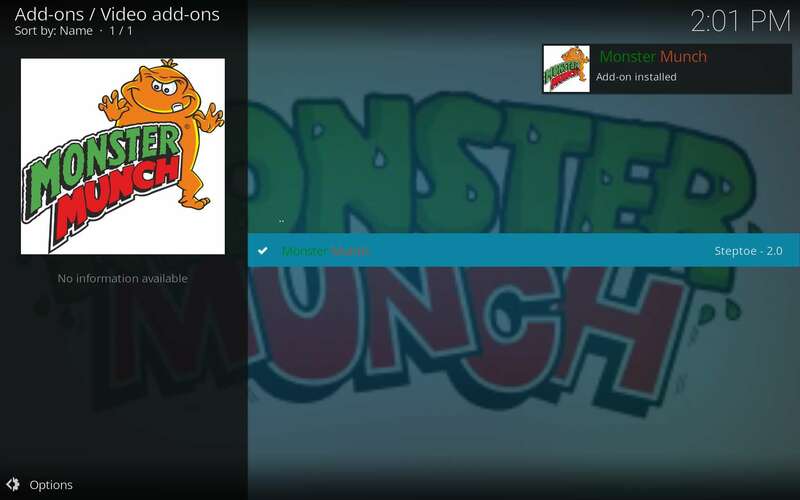 Following a slew of automated download, extraction and installs for Monster Munch dependencies, then you see Monster Munch installed. 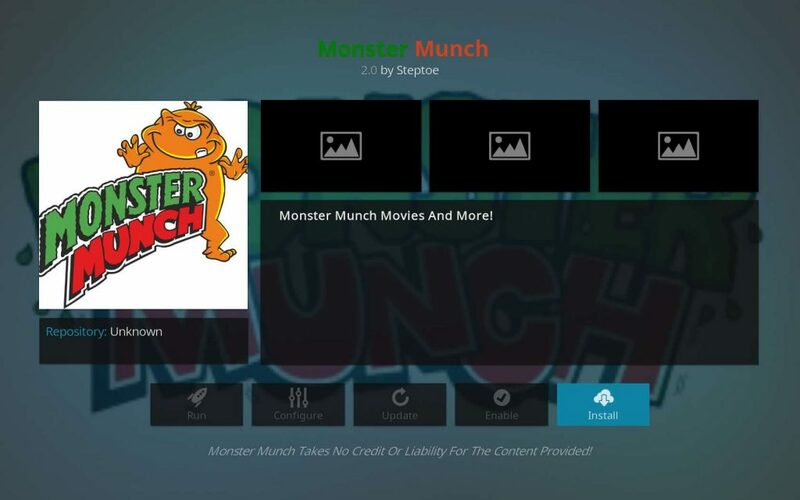 You’ll now find this wonderful click-once-to-view TV addon in your Kodi Video add-ons folder – Monster Munch! 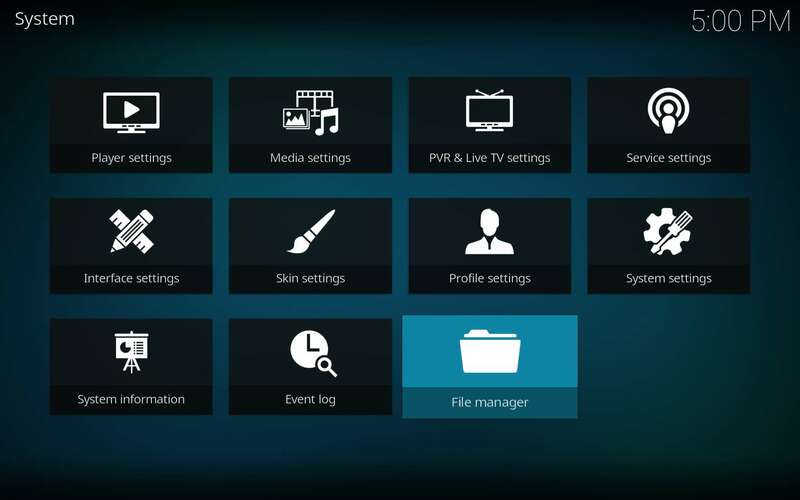 One of the smartest Kodi TV addons available, Monster Munch improves upon many of its predecessors. Don’t get too comfortable with the one-click-and-play, though. Using a high quality VPN allows you to enjoy your shows without the otherwise inevitable ISP cease and desist letter. 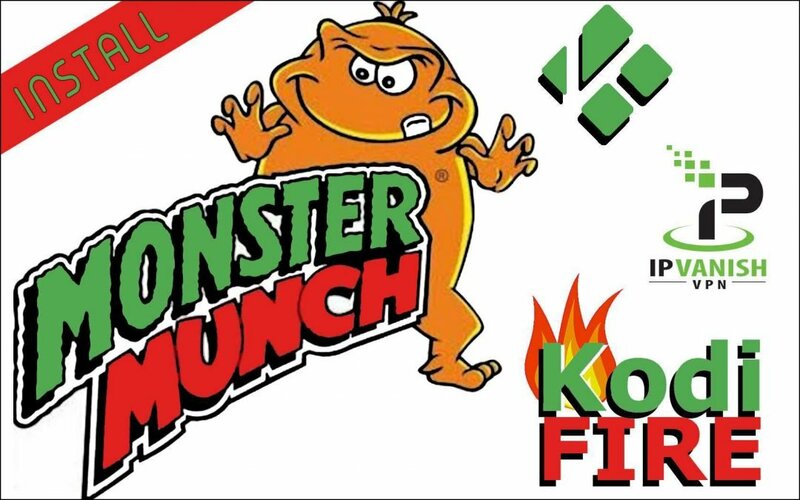 Remember, the official Kodi support forums consider Monster Munch unofficial. Neither the XBMC Foundation nor Kodi TV will support or answer questions you might have. They will likely harass you a bit concerning piracy, warranted or not, then ignore or ban you. Ask support questions in the comments below. We’ll be happy to help if we can. 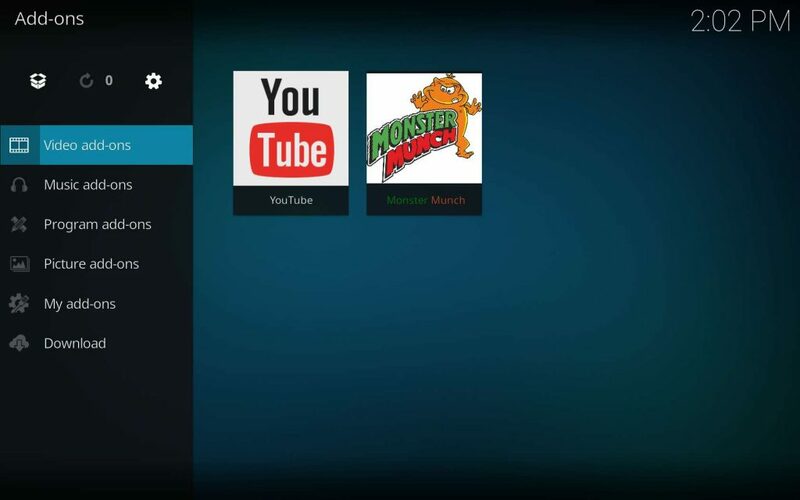 Monster Munch is a wonderful click-once-to-view Kodi video TV addon with movies, TV shows, sports, radio, and much more! Follow this how to install guide! Does not download. Failed to install dependencies. 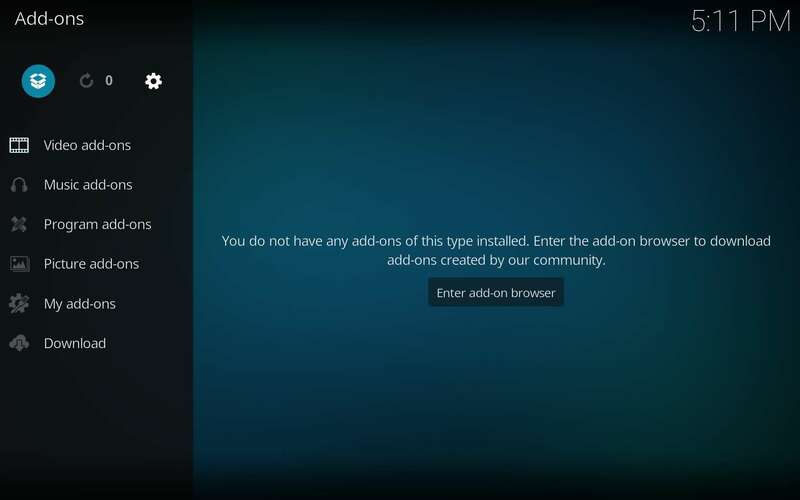 I just did a quick install on a spare PC and had no problems with failed dependency installs. It’s possible you are attempting to install without a [ivp chan=”jh”]VPN[/ipv] from a location (Trenton, NJ?) that is blocked by an anti-piracy group or government agency. This is happening more an more lately with people that don’t use a VPN.